Player B has the worst statistics by a large margin and is obviously Josh Freeman. 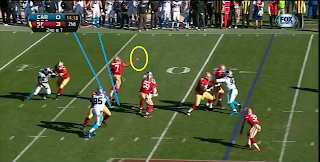 Player A is Colin Kaepernick and Player C is Cam Newton. Colin's passing stats are mostly mediocre but his gaudy yards/attempt total bolster his ANY/A (also known as ANYPA, or adjusted net yards per attempt - this stat adjusts touchdowns, interceptions, and sacks into their yardage effect). Cam's completion percentage is decent but he has thrown a fair number of picks and also takes too many sacks. Who is the mystery Player D? He completes a decent % of passes, doesn't turn it over, and rarely takes sacks. His rushing stats aren't bad either. Did I sneak Andrew Luck or Russell Wilson into this comparison?No. 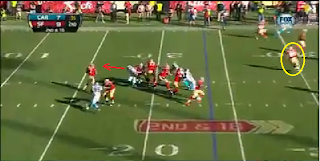 Player D, believe it or not, is 2010 Josh Freeman. Freeman during that magical Bucs season. Freeman before was shell-shocked by too many sacks and broken protections. Freeman when he still showed so much promise. So how do guys like Cam and Colin, who are thus far putting up worse numbers than 2010 Josh, get to an elite level without becoming 2013 Josh? Again, both are coming off bad games albeit against elite defenses. 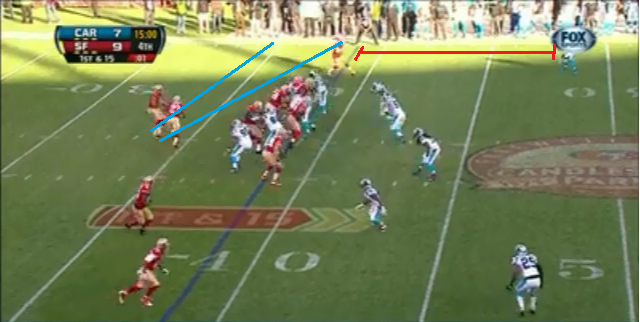 Facing each other, Cam and Colin posted adjusted-yards/attempt of 3.88 and 2.09, respectively. Was this a by-product of the aforementioned defenses or is something bigger going on here? 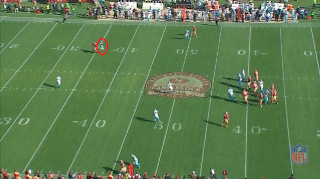 1: Flare complete off play-action to the fullback, Bruce Miller, for 10 yards. 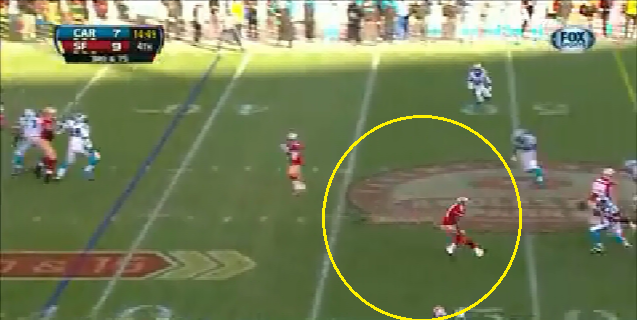 The end zone cam shows just how good a jump Miller had on the linebacker in coverage. 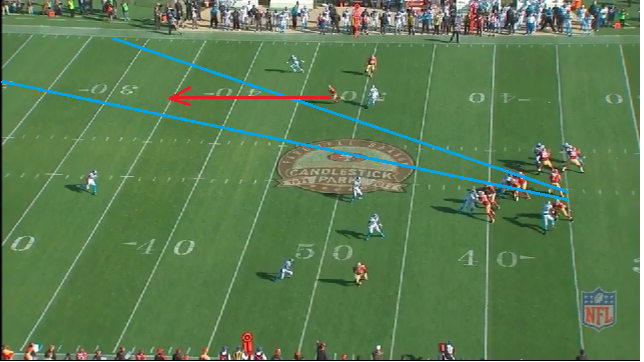 2: This was a go route to the slot receiver that should have been picked. 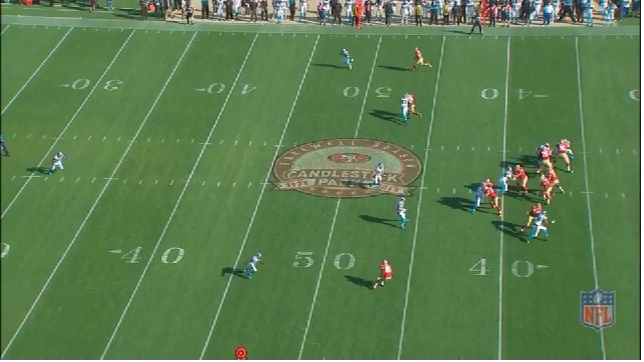 Colin actually gets his feet set in exactly the right direction, but mis-reads the corner as playing man when he is in fact in zone coverage playing the deep receiver. The corner does a fantastic job jumping in front of the route. 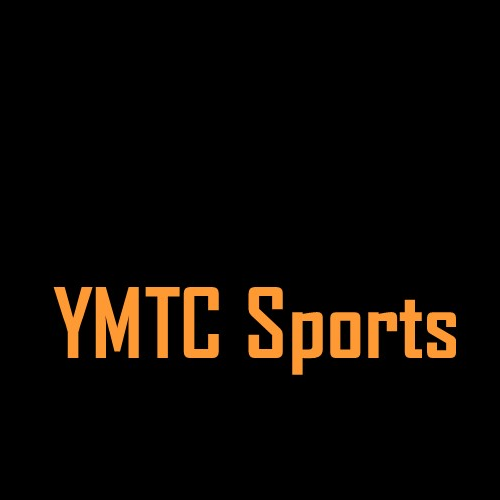 It's a hard thing for young quarterbacks to learn to throw over the coverage with touch - many want to throw frozen ropes directly to receivers and it doesn't work all the time. 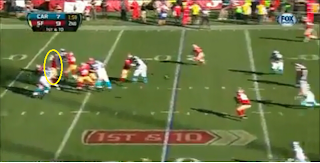 3: This is a little 5 yard comeback. 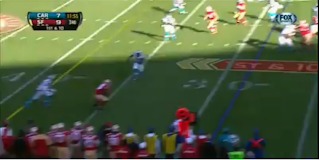 Look how he recognizes the safety and gets his feet pointed to the sideline where the pass is going. 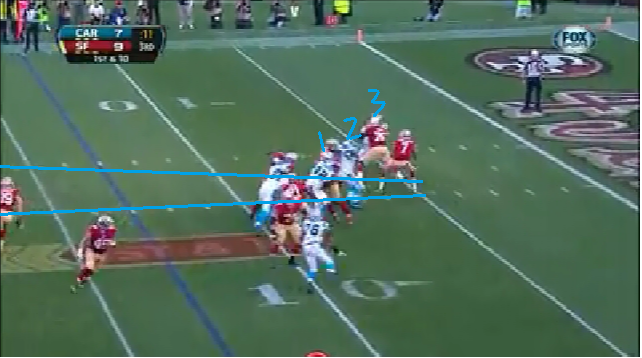 4: Another comeback: ~9 yards to a corner playing soft. 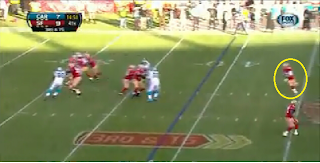 Colin should turn his hips to the right more - the receiver is so open that the slightly high ball isn't a huge problem here, but you gotta work on little things. 6: A few things here: Look how far back he is. 49ers coaches regularly had Colin taking 5- or 7-step drops. 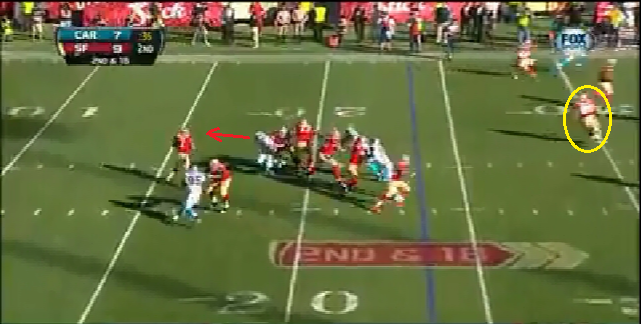 I'll get to more of this later, but here he is almost 10 yards behind the line of scrimmage. This was almost disastrous but Colin somehow escaped up the middle for 7 yards. 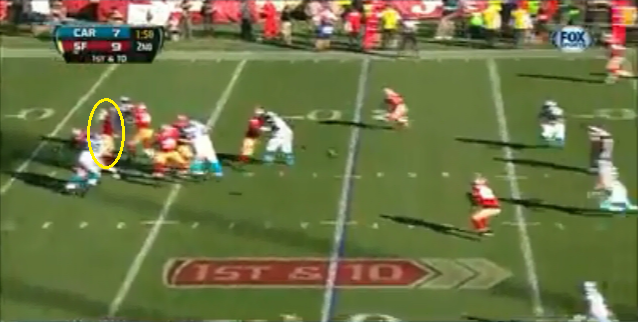 7: 10 yards checkdown to Gore in the middle. 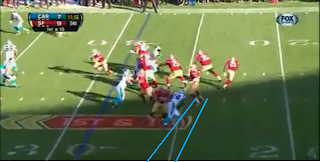 Feet are set to go deep, but nobody is open. 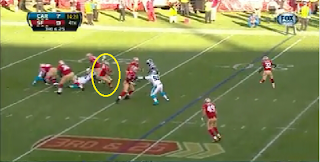 This was a theme of the afternoon: the receivers just couldn't get open before the rush got to Colin. 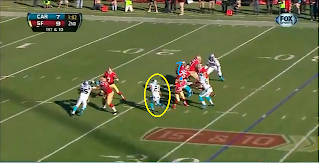 Carolina purposefully played with safeties deep knowing that the linebackers could fill against the run well enough. 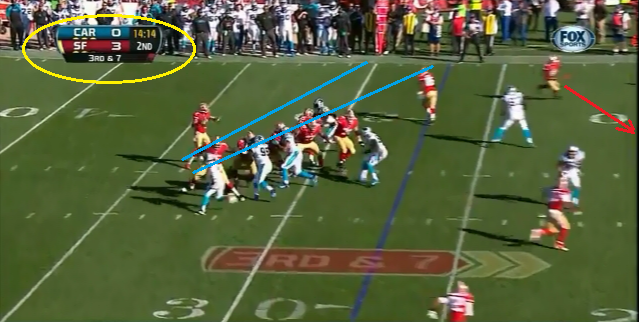 The middle of the field was open the whole afternoon, but Colin and the 49ers were unable to consistently take advantage of this space. 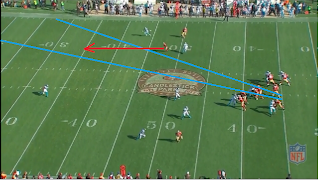 8: This is a sideline route that was thrown late and high, resulting in an incompletion. First, notice how low Colin is holding the ball and how his hips are almost parallel to the line of scrimmage, anticipating the rush. Great QBs never get this loose with the ball. I understand that the edge rusher is bearing and he may need to take off, but as along as he's in the pocket, he needs to play with correct posture. As a result of his open hips, his feet are actually pointed backwards and to the left. Look at his hand position relative to the ball in the second shot: it's below the ball, which means the ball is spinning up and away. In the third shot, you can kind of tell that despite the faulty mechanics, Colin's arm talent gets the ball near where it needs to be, but the catch is unnecessarily difficult and ultimately falls to the ground. 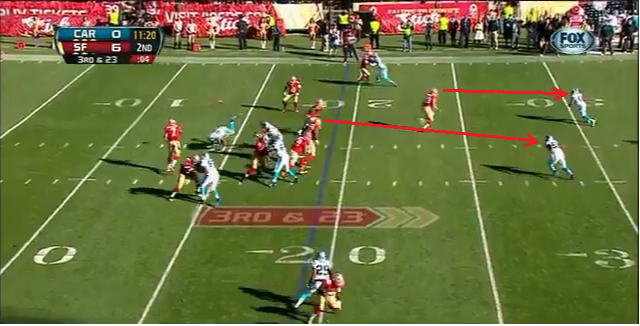 9: This is an out route on 3rd and 7 that is 6 yards short of the sticks. 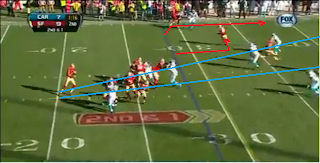 Colin has plenty of time to throw despite an extra rusher, and he just doesn't see that the outside receiver on the left has inside leverage. A terrible read. 10: This was an attempted play-action fake, but the end did not bite at all. 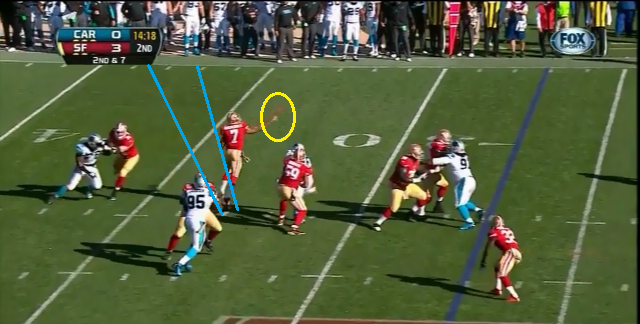 The play resulted in a huge grounding penalty, but wasn't necessarily Colin's fault. There's little he can do here. 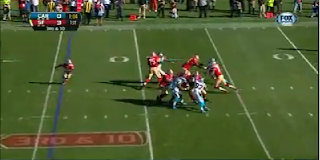 11: At first, it looks like a well run screen pass. 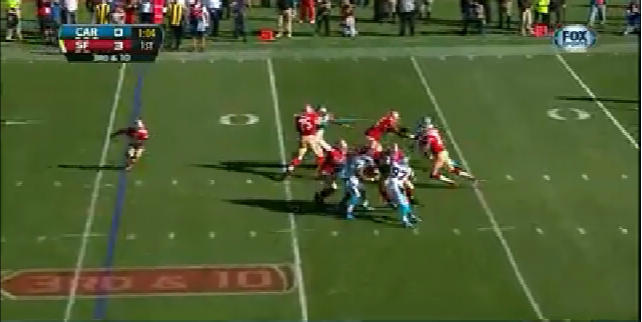 The outside receiver has sealed his man and three blockers are heading into the secondary. 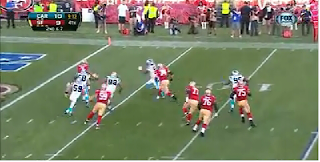 In the 2nd shot, the lead lineman has taken out the first safety safety, the middle blocker is responsible for the second safety (shadow at the far right of the picture), while the third blocker needs to put a hat on the linebacker. 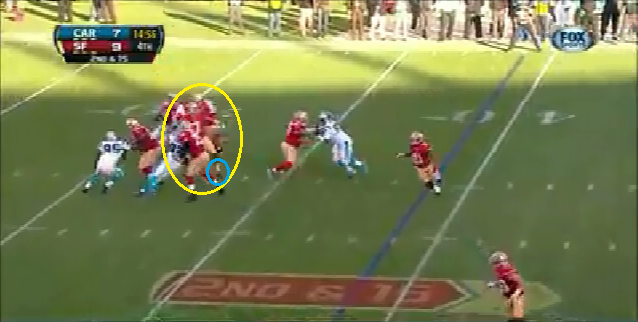 In the 3rd shot, that blocker has barely moved while the linebacker has filled a crucial gap. Still shouldn't be a problem though. 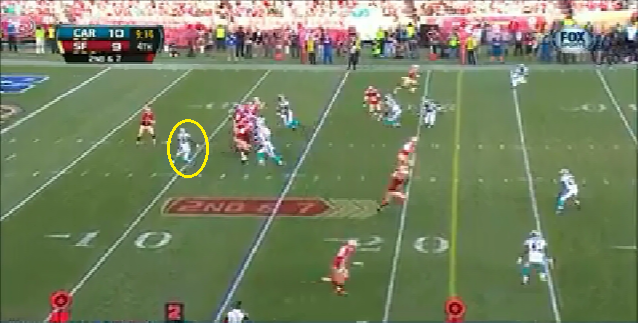 As long has he gets his hands on the defender, the receiver has a nice cutback lane to the middle. So what happened? 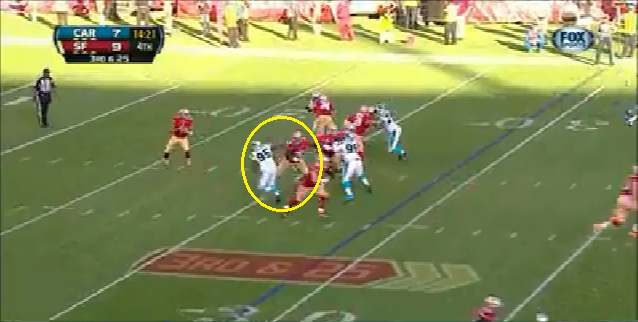 Mike Iupati completely whiffed on the block and a promising play turned into only 5 yards. 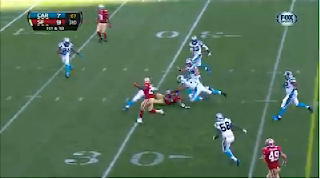 12: Near the goal line, they run a little roll-out to Vernon Davis. 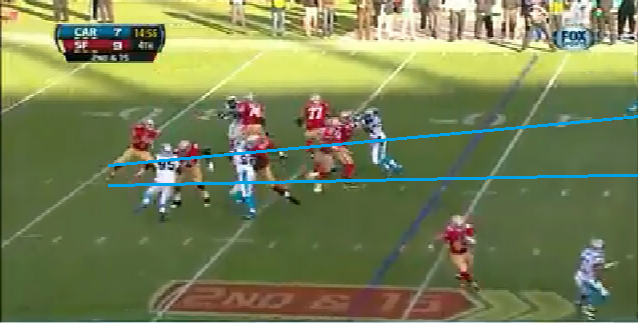 Kaep places this right on the money: notice how Vernon can secure the ball without getting too far off the ground. Unfortunately, Vernon was concussed on this play and dropped the ball (should have been ruled a fumble). 13: Kaep does a fantastic job standing tall here. Again a very deep drop. 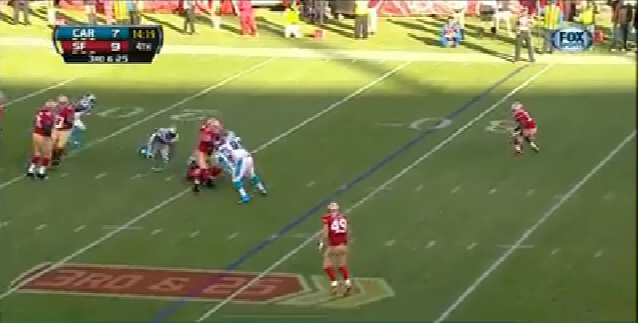 It seems that 49ers coaches A) recognize that the receivers are going to take their sweet time getting open, necessitating drops, B) realize that Colin isn't great at throwing touch passes over the top which travel longer in air, allowing the QB to throw earlier, and C) don't trust Colin's ability to read the defense super quickly. 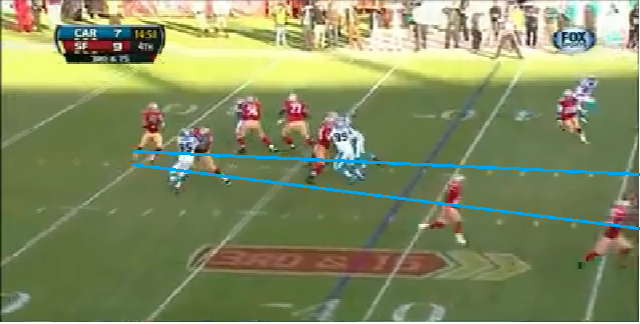 Anyway this was complete to Anquan Boldin for 8 yards over the middle against zone coverage. 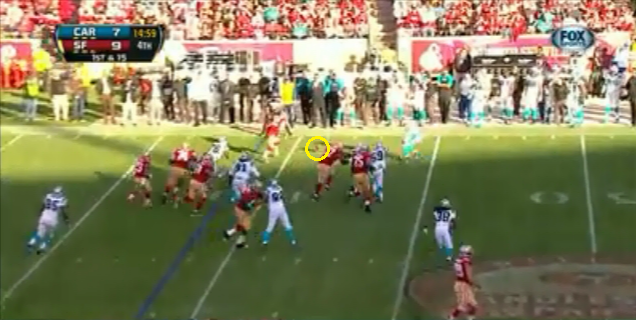 14: Kaep is trying to go left but isn't able to tell if the DBs are in man or zone coverage (it was zone). 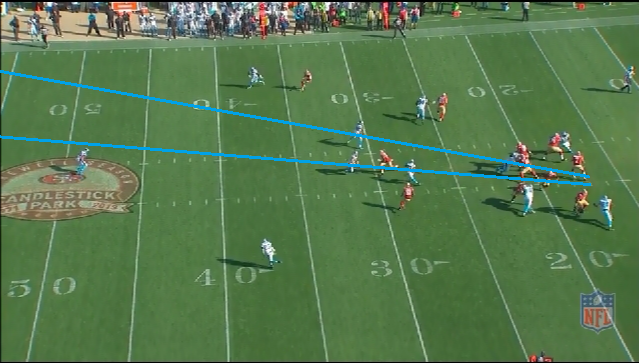 If he guns it to the out route, will the outside corner playing Cover-2 zone jump it? 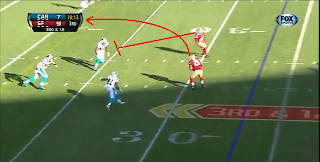 Or is the corner playing man and running with the go route (he should have thrown the out)? And if zone, what type? 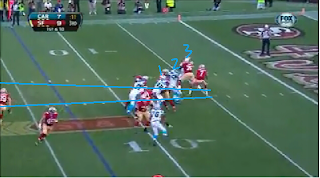 Quarters with the corner playing deep and the linebackers underneath, or Cover-2 with the corner working back to the flat? He's uncomfortable deciding and tries to flip it back to the right. Problem is he doesn't have time to turns his hips and the throw is low and incomplete. 15: The protection lets a man run right through for a humungous sack. 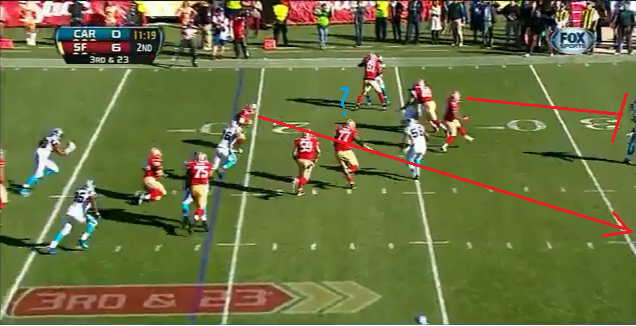 It's a blitz but they have 6 to block 5. 16: Again a blitz and again they get pressure up the middle. 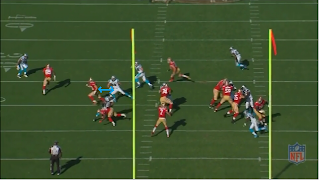 The Panthers are still leaving the middle of the field open but Kaep is flushed and settles for a 2 yards on a roll-out to the left side. On 2nd and 16. So, yeah. 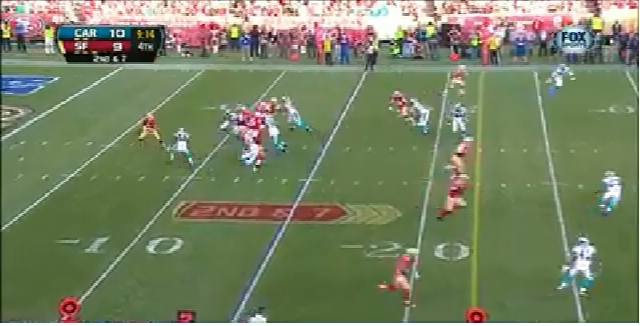 17: This play is complete because it's a simple throw against off coverage. 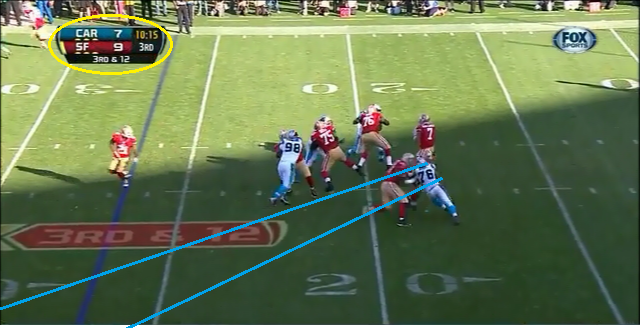 But Kaep needs to get his feet in the right direction to complete balls against tighter coverage. Pocket integrity is there and he needs to trust it despite its earlier failings. 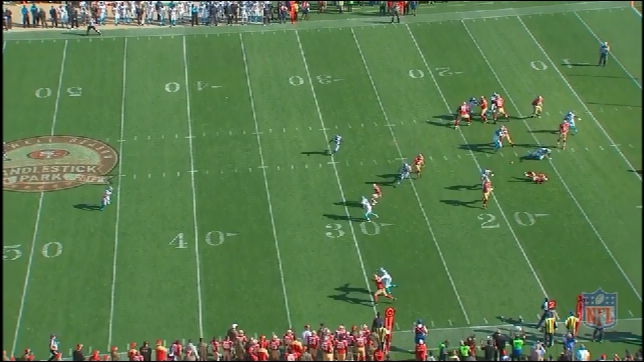 18: Another checkdown to the open middle of the field. 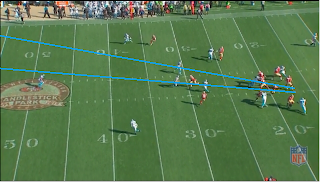 There is potential here with a receiver blocking... but the receiver doesn't block and Gore is stopped a few yards short of the first down. 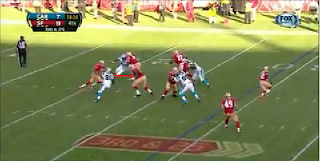 19: In LeBron's parlance: not 1, not 2, but 3 rushers in Colin's face. 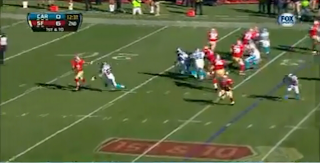 Another miraculous escape for 15 yards + a 15 yard late hit penalty. 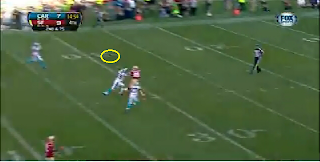 20: WR screen to the left, good throw against off coverage but the ball was dropped. Sour. 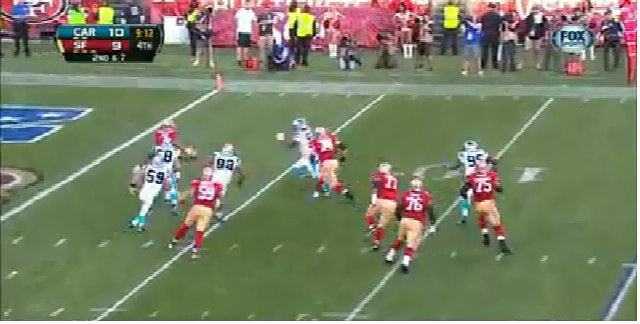 21: Kaep's best throw of the night. Feet are set correctly against a heavy rush; you can barely see him or his front foot when he releases the ball (I circled him for you). 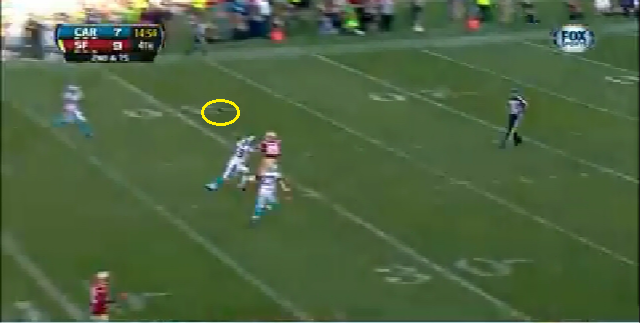 It's a great touch throw against tight coverage where the safety cheated. As I've mentioned, throws requiring arc over the defenders are tough for young, strong-armed quarterbacks, and this one was perfect. 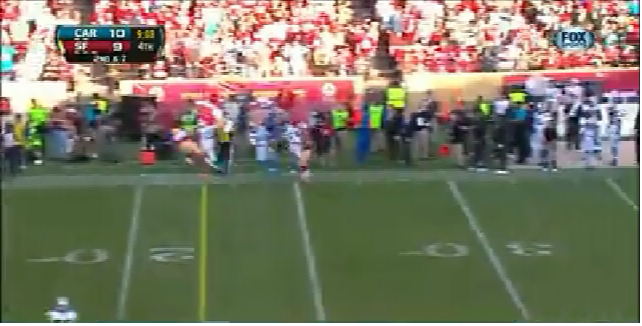 Unfortunately, Garrett Celek drops the big-play ball. 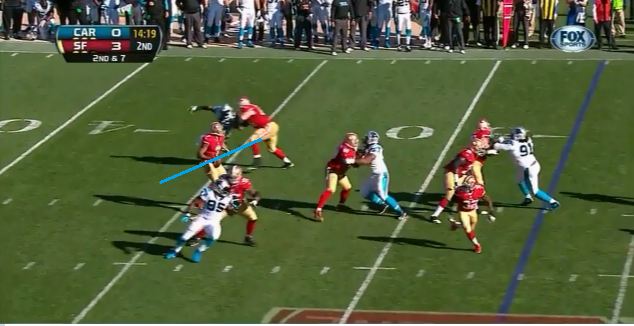 A completion here was probably worth something close to 3 points in a game the Panthers won by 1. 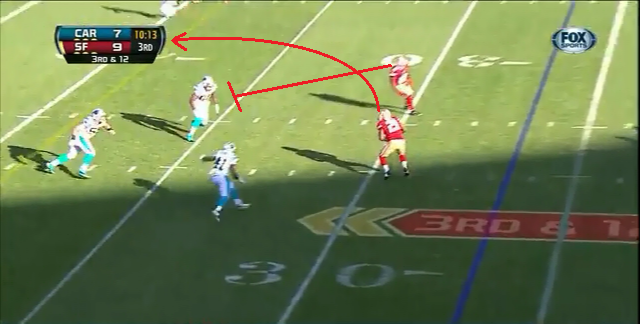 22: 2 straight pass plays where the receivers have let the team down - can they do it again? This was a drag route thrown accurately over the empty middle of the field complete for 10 yards. 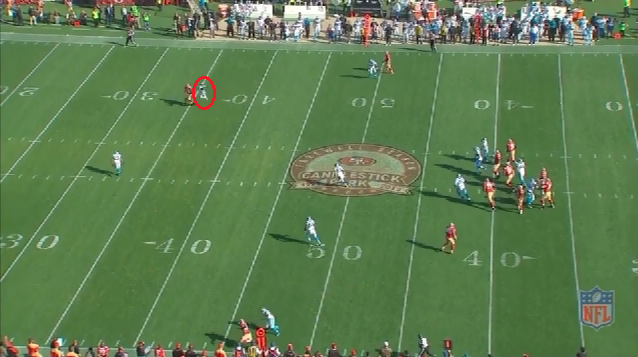 There's not a defender within 7 yards of the receiver. Look at Anquan Boldin tackling a guy downfield! What toughness. Wait, pass interference? What?! You can't tackle now in this league? 23: Don't worry. 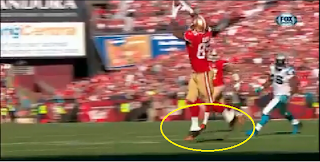 It wasn't just the receivers that let Kaepernick down. Here we have a whopping 7 players to protect against 4 rushers. 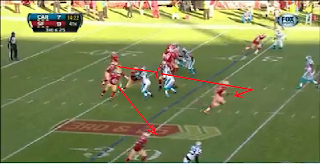 The tight end on the right is to chip an edge rusher then run to the flat while the running back checks for a blitz up the middle then leaks out as the checkdown. Great. In the second frame you see that the back is in helping and the TE is leaking... right as the left end destroys right tackle Anthony Davis on a swim move. Look at how much space the rusher has generated in the third frame. Colin somehow steps up in the pocket and almost breaks free before being caught by one hand from behind. What a debacle. Notice also how Colin is 9.5 yards behind the line of scrimmage on his drop. 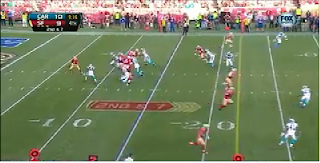 From what I've seen, the coaches have him consistently drop deep so the receivers have more time to get open and so Colin has more time to correctly read the defense. 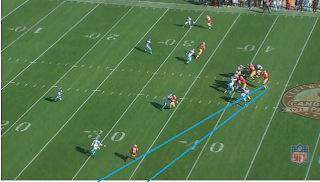 I'm sure he's very intelligent but it seems he's a beat slow recognizing coverages, what the safety is doing, etc., than upper echelon passers. 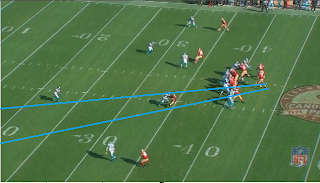 The downside to this strategy is that it makes it easier for rushers: they know he has to drop straight back to a certain depth and can tee-off on that area. Short drops allow more flexibility for the QB to move left and right and find an open throwing lane. 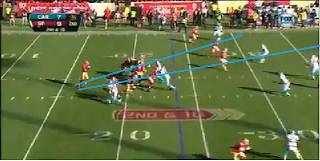 Colin already has issues with passes batted down - he seems to have a 3/4 arm slot that isn't a problem in itself, but because he throws bullet passes that travel flat, allowing defenders to get their arms in the way. Tom Brady, the bets short ball thrower I've ever seen, throws these passes with a slightly altered motion: the ball starts way high, above his head and is thrown downwards. 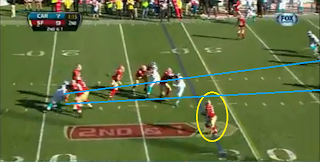 This gives him clearance over the defensive line and also gives his index finger extra leverage for accuracy. Finally, short drops make life easier for the offensive line: the tackles can chip speed rushers around the QB, knowing that their momentum will take the defenders too far into the backfield, and by the time the work back to the QB, he should have either taken off or thrown the ball. It's not necessarily that the drops are too long - every offense includes long drops, but the best offenses have tremendous variety from where they throw the ball. 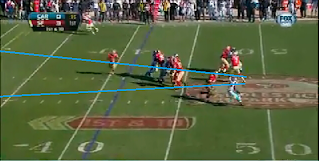 Watch Peyton or Brees - They are comfortable throwing to a variety of depths from a variety of places in the pocket. 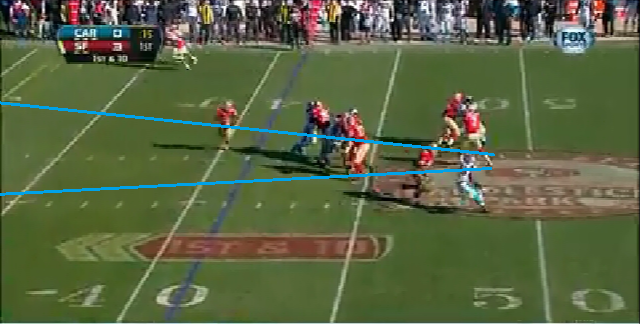 This catches rushers off-guard and makes them more disciplined, e.g., slower. They have to do this because they don't have the athleticism to run around in the backfield, and the 49ers coaching staff could learn a thing or two from them. 24: Don't worry. It's almost over. 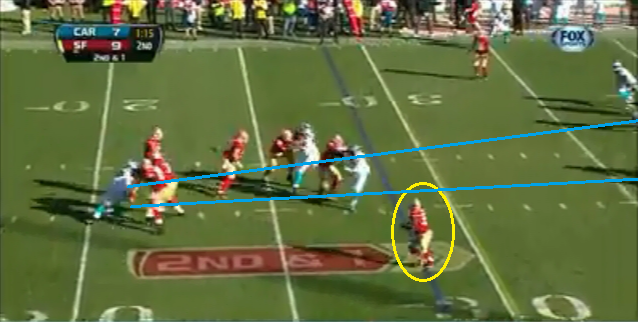 The offensive line completely missed this linebacker on a blitz and Colin incredibly still gets the ball away. 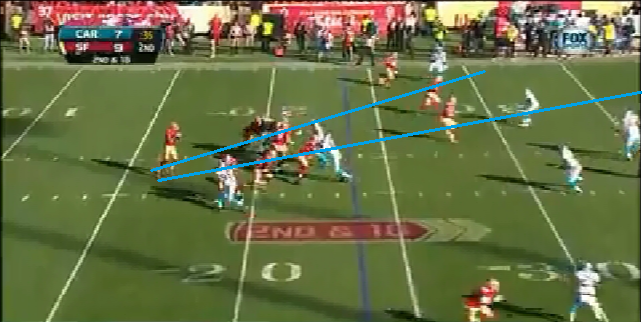 25: This is 3rd and 7, and look at how far Colin has dropped back - again 9.5 yards behind the line. He's basically trying to convert a 3rd and 16. This was one of Colin's few bad reads. His feet are pointed slightly left, but his eyes are trying to make sense of what's going on the right side. 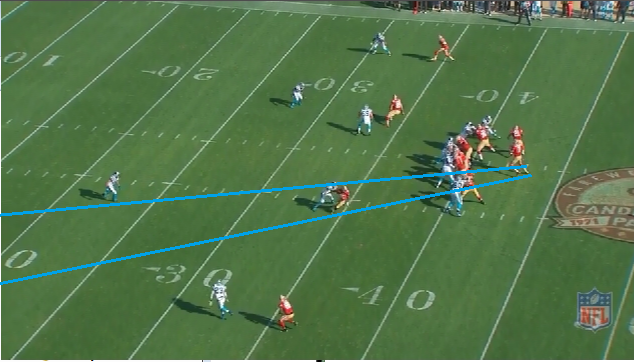 Everyone is covered on that side and the right play is the receiver with a step on the left. Maybe he didn't believe his guys could get this open, but he tries to fit the ball to the corner route deep right and throws incomplete. 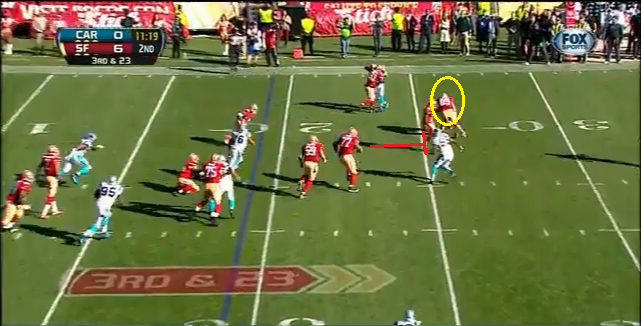 Reading defenses and looking off the safety is an advanced skill, but one that Kaep will have to master eventually. 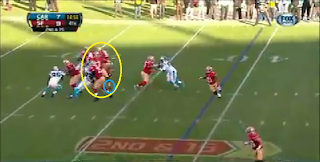 26: They tried to fake the inside handoff but the pass rush smartly didn't bite. 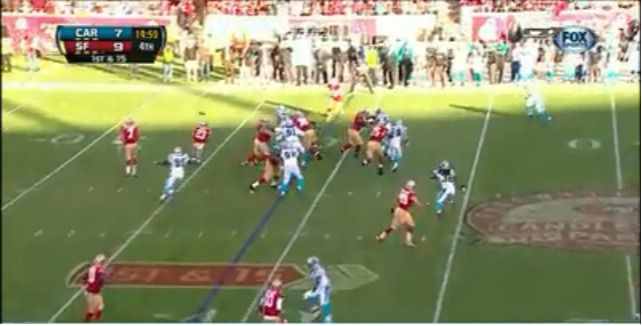 The 49ers aren't going to hurt them running the ball on the 1. 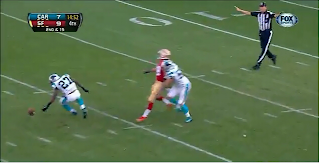 27: This was a great throw. First, with the rush bearing and in the end zone, Colin stands tall and has his feet right. 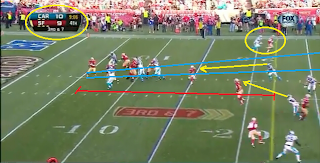 The throw is right between two defenders in zone coverage to the only place where it can be completed, and allows the receiver to use his momentum and pick up a huge first down. On time and perfectly located. 28: This was an ugly delayed blitz by one of the best defenders in the game, Luke Kuechly. He blows up the interior of the line and gets a huge sack. 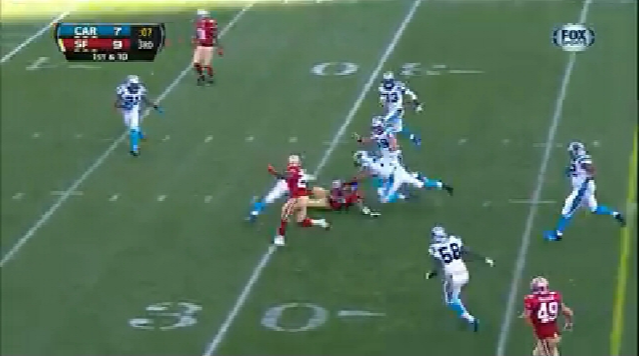 29: After the big sack, Colin gets happy feet and the throw is off. it still gets there, but it's a little high. 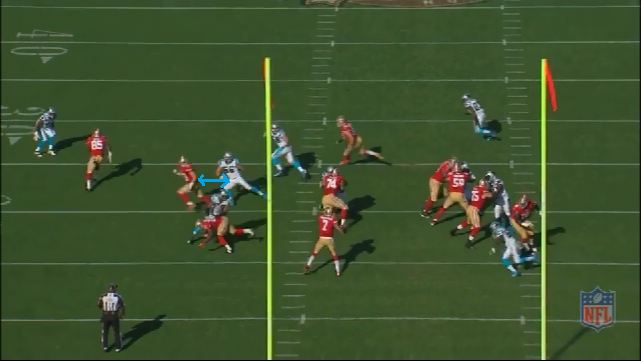 The Panthers are playing off to prevent a big play though, making windows bigger. 30: Pressure forces Colin from the pocket and he throws a high ball on a dead sprint to the sideline. I know the game is coming down to a few plays and Colin can't take a sack, but he has to hold that ball higher. It's a little too Johnny Manziel. 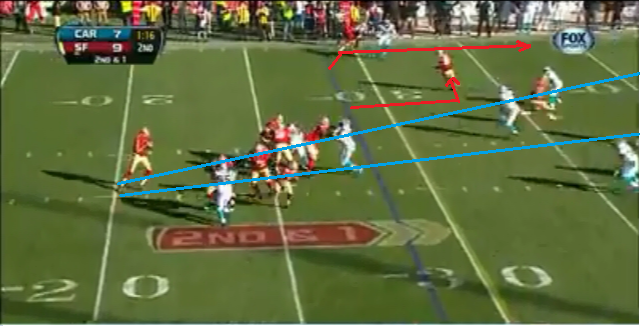 31: Starts off promising, except the left end has the right guard beat again. This sack puts the game out of reach. 32: And this interception ends it. 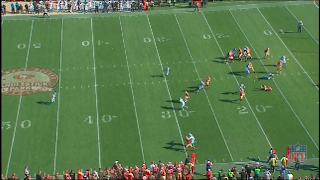 The most baffling part is the two receivers occupying the same space: it makes them easy to guard and the interception inevitable. Good throwing mechanics: Good footwork in and out of the pocket. Feet are mostly pointed the right direction even with heavy pressure the whole afternoon. It wasn't perfect, but it wasn't sloppy either. He does need to keep that ball high and not get loose with it. 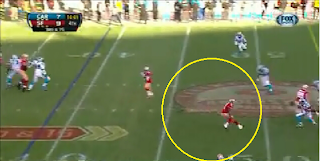 Good decisions: Outside of his second throw which should have been picked, he threw away from coverage. 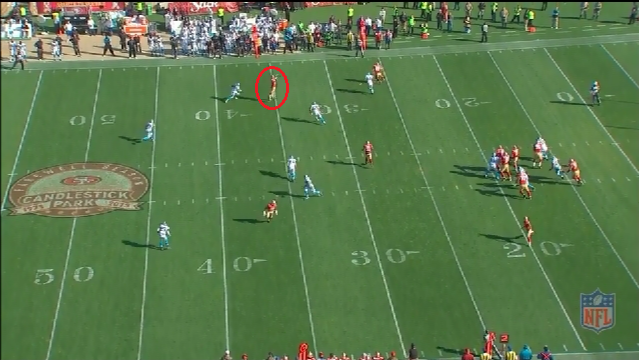 He did miss some opportunities with one-on-one coverage, but he avoided bad decisions. I can't blame him for the last interception - the game was over anyway. He was ready to throw at the top of his drop and didn't hesitate. ...the need to harness it with Touch. Colin, like many young QBs, needs to learn to put a little air under certain passes to put them out of the defense's grasp and also give his receiver an extra beat to get open. Of the young starters, RG3 (at least before this year) and Russell Wilson are the most advanced at this skill. Faster decision making: He needs to identify zone/man coverages faster so he can A) get the ball out more quickly and take fewer sacks, and B) give himself time to look off safeties, adjust is feet to the throwing path, and do other elite-QB things. Colin needs to get better at pre-snap identification of coverages and blitzes; the 49ers often take offensive timeouts when Colin is uncomfortable with the defense he sees, and it seems he just needs more experience reading things. Dropping back: Colin is a tall, lanky athlete with long legs. When he drops back, he often looks herky-jerky. This may be the by-product of coaching: I've heard many QBs say that college coaches told them to drop back as far as possible as fast as possible. 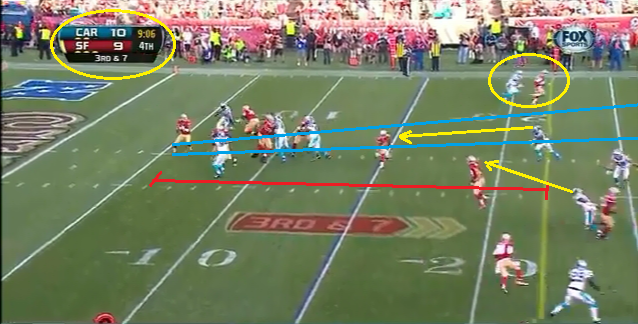 In the NFL, route timings, throwing lanes, and receiver chemistry require more nuance. Smaller, smoother steps would allow Colin more wiggle room in the pocket, especially when trying to avoid edge rushers that are rushing to a predetermined depth. The receivers were abysmal. 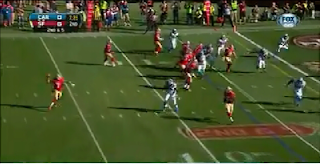 They really need Michael Crabtree - none of these guys are getting open by themselves. Defenses know that, and are committing extra guys to the run game, necessitating the use of Vernon Davis as a blocker instead of receiver. The coaching staff needs to vary its scheme. 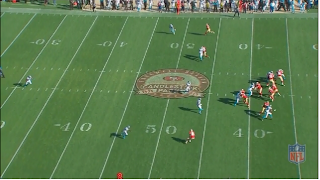 I know the 49ers passing game is predicated on high yardage/attempt numbers and throwing downfield, but their receivers simply could not get open fast enough. 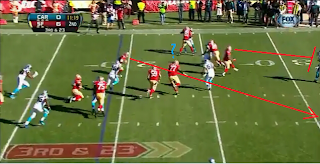 They need to mix in more intermediate routes than the occasional Frank Gore dump-off. 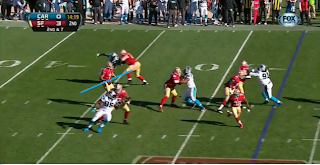 I know Frank is needed for pass protection, and losing Vernon Davis may have changed the equation, but where are the running back flares, the wheel routes, and other easy-to-complete passes of yesteryear? The coaches have to get more creative with where Colin throws from and to. Ultimately, I still believe in Colin. I think he'll get a lot better with a quality NFL starter catching passes (in the Saints game, 49ers receivers not named Anquan Boldin caught 1 pass for 8 yards on 7 targets - let that stew for a moment) in Michael Crabtree. He plays with good fundamentals and his arm is something else. Once the game really slows down for him mentally, watch out. Love this article. I think its a really accurate and fair analysis of CK7s passing game.